The word Tiffany has taken on a generic connotation. Not all lamps called “tiffany” are Tiffany designs. We only do Tiffany Replicas from designs that originated in the Tiffany Studio. In addition to the ones shown here we have a catalogue of many others for your choosing. Contact us for a price list and/or a catalogue. 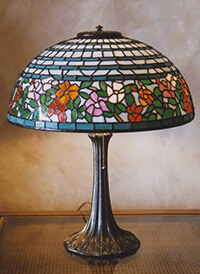 This is one of the most prized Tiffany Lamps because of the irregular lower border. Louis C. Tiffany himself designed the base and the replica is available with the shade. LC was fascinated with the peacock and it was the subject of many of his windows, so he had his studio design a table lamp to celebrate the proud bird. 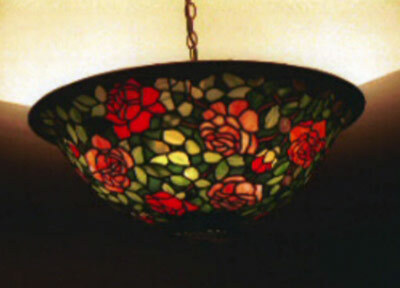 One of the many flower lamps that were a favorite of the Tiffany studio designers. It goes well with the décor of any room. Because these lamps are priced by the number of pieces this is one of the most expensive of the replicas. The base is one of a kind and is only used for this lamp. This is no doubt the most popular of the Tiffanies. There are many different shapes and sizes that make it available in a wide range of prices.